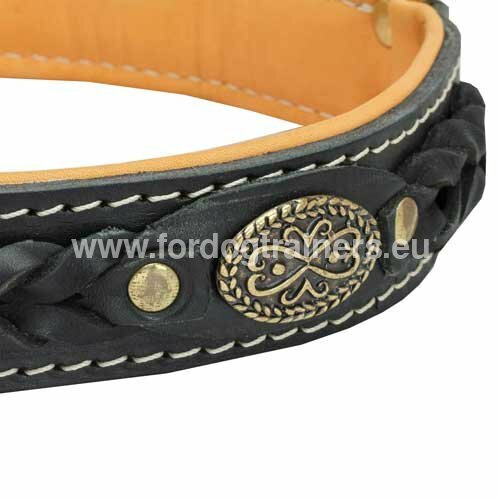 Stylish Leather Collar with Braids and Brass Fittings for Pitbull. 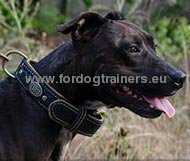 It is true that originally Pitbull was bred to entrap bulls, but later it became a farm dog and then, because it is very gentle with children, Pitbull became one of the favorite family dogs. 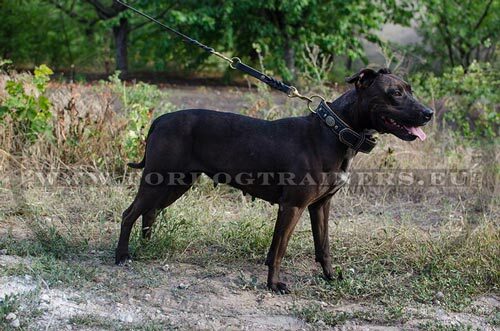 Properly cared for and socialized from his early age, your Pitbull will make you proud. Help him by offering beautiful resistant dog collar, so diligently stitched and so willingly ornamented with peculiar leather braids, brass studs and oval metal plates. 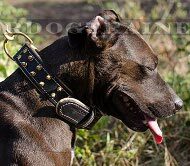 This collar is not only stylish, but also very strong - we understand how important it is not to underestimate Pitbull's power. Well, you see how this dog collar is outside, but is it good enough to wear? Of course it is! This braided collar for Pitbull is very comfortable thanks to nappa padding and optimum width. 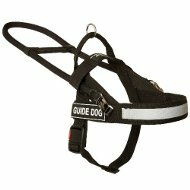 It has rust-resistant buckle and D-ring for leash, which allows you to control your dog without fearing to hurt him. 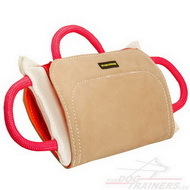 Do you want to offer your dog an excellent functional and fashionable dog accessory? 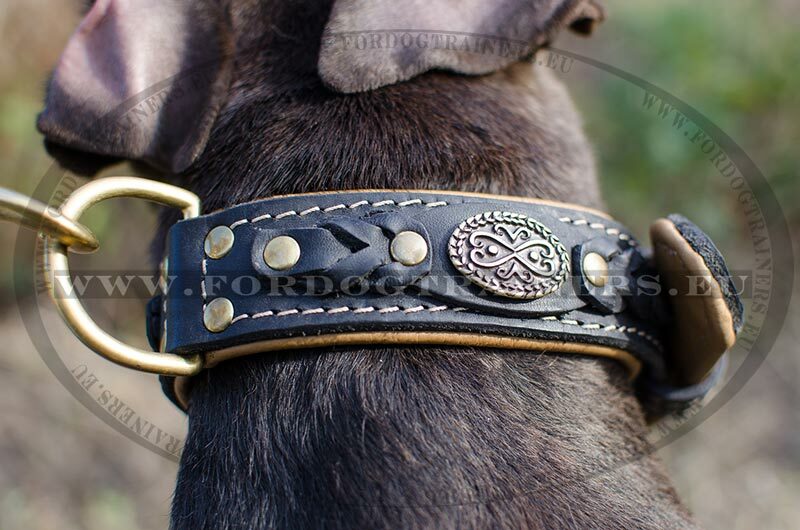 Order the collar right now and realize your dog's dreams! 1. 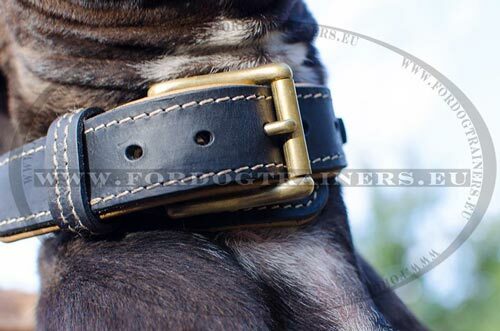 Hello, These collars I've got today are so impressive - really stylish and their quality is stunning. Fit perfectly for my dogs. Thank you very much, hope to send you pictures. 2. Good afternoon! We have received the collar for our Mastiff, the delivery to England took only seven days! Everything about the product is beyond our expectations, it is perfect. 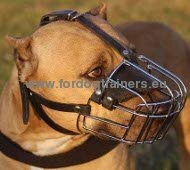 We have never seen such a dog collar in this country, thank you very much this is really a first-rate quality dog accessory. 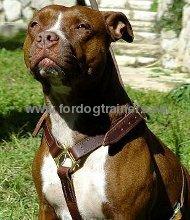 Choose among other Dog Products for Pitbull in our on-line pet store!